In response to increasingly stringent rules governing the energy conservation performance of buildings, Architen Landrell has developed a tensile roof system that is capable of meeting the very high thermal values of an insulated conventional roof, while retaining the virtues of sculptural form and a clear structural span. The company has developed a sandwich system and the technology to pattern and join panels that provides an extremely versatile approach to insulating membrane roofs. This system received its debut at the historic naval shipyard in Chatham, United Kingdom. The original shipyard buildings have been restored to create a retail mall, which is augmented by a new food court building that features a 200 ft long arch supporting a tensile fabric roof. The development of the system has created a significant stir in the UK construction world because it has the potential to dramatically expand the number of applications for tensile membrane roofs. People have grown accustomed to tensile fabric being used for stadia and unheated venues, but now the opportunity exists to employ a high performance membrane system as the external envelope for virtually any building. The Chatham Outlet Mall has been created in a restored historical landmark building which was originally constructed at Woolwich Dockyard, London, in 1847. It was dismantled and re-erected at its present location in the Naval dockyard at Chatham in about 1876. It comprises a clear central nave with lower aisles running along the North South elevations. The building is historically important as an early example of the use of cast and wrought iron, most of which can still be viewed in the shopping area. The building was the forerunner to some of the greatest clear span buildings of the nineteenth century. After completing the Boiler Shop at Chatham, the contractor went on to build Sir Joseph Paxtons Crystal Palace for the Great Exhibition of 1851 as well as Waterloo and Paddington Stations in London. To add a tensile membrane to such a sensitive site may seem a brave move but in fact is was determined by the historically significant building it adjoins. The Boiler Shop is one of the earliest examples of a large scale iron framed building in the UK and the local planning authority was adamant that any extension would stand comparison with the innovative engineering of its nineteenth century neighbour. 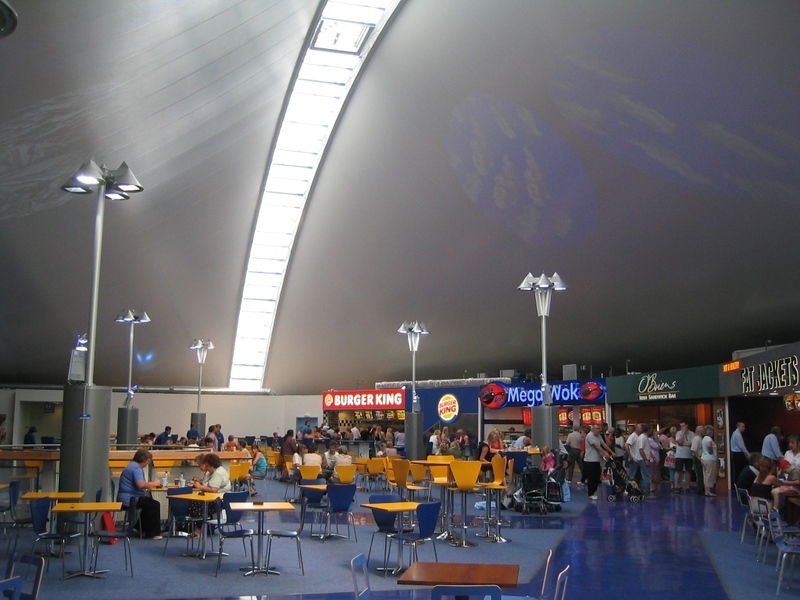 During the initial design process the food court, with its large tensile membrane roof, offered a double curvature that it markedly different to the angular lines of the Boiler Shops iron structure. The planning authority was particularly impressed with the incorporation of a 200ft steel arch from which the fabric is draped, echoing the large spans of the neighbouring Victorian structure. The curvature of the new roof addressed the need for a landmark building that reflected the history of the docks and the sail-like form reminds visitors of the buildings seafaring past. The membrane roof Is 70ft high and supported by the steel arch which transfers the compressive loads to the ground by way of two concrete buttresses. The roof membrane is fixed to a steel perimeter structure supported by seven steel columns which carry the tensile loads to the foundations. Recent changes in the laws governing new construction in the United Kingdom have made the incorporation of large tensile fabric elements a considerable challenge for designers. Being such a lightweight material, fabrics inherent limits of thermal performance severely restrict the applications to which it may be put. The strategy adopted in previous years of compensating for poor thermal performance in some areas with a super insulated construction elsewhere has now been made more difficult to implement. Limits in this trade off process mean that the architects wishing to use tensile construction face the prospect of confining its use to areas that are essentially protected external areas or keeping the areas to a minimum. Although various methods of measuring building performance may be used, including quantifying Carbon emissions and whole-life impact, the need to insulate buildings to a much higher standard has become unavoidable. The new thermal insulation regulations require a U Value of 0.25W/m2 C (SI Units) or 0.044BTU/hr/ft2 , F for roof construction, which would typically be achieved using six inch think fiberglass quilting. The construction detail must also reduce cold bridge penetrations and show a measurable reduction in unwanted air leakage which reinforces the established practice in roofing construction of creating a continuous air and vapour barrier above the thermal insulation layer. Architen Landrell (i) was approached by the architect (ii) to design and supply a tensile membrane roof within a tight budget whilst achieving the new thermal insulation requirement. The company had previously researched lightweight tensile acoustic insulation for fabric structures and had developed a system that was installed in a 1000,000 sq ft demountable theatre at the millennium exhibition site in London. This work was the subject of a technical presentation on the development of an acoustic and dual coloured PTFE fabric for tensile structures at the IFAI Expo 2000 (iii). The company used the lessons learned at that time to develop a method of combining high levels of thermal insulation with a curved membrane form. The method requires three membrane layers; an outer membrane identical to a normal tensile roof; an insulated membrane suspended beneath the outer layer; and a lighter weight inner lining giving the underside for the system a smooth appearance. To ensure that the thermal performance of the regulations was met the insulating membrane was made from a sandwich of Isowool (iv) insulation surrounded by aluminium foil and layers of encapsulated air. 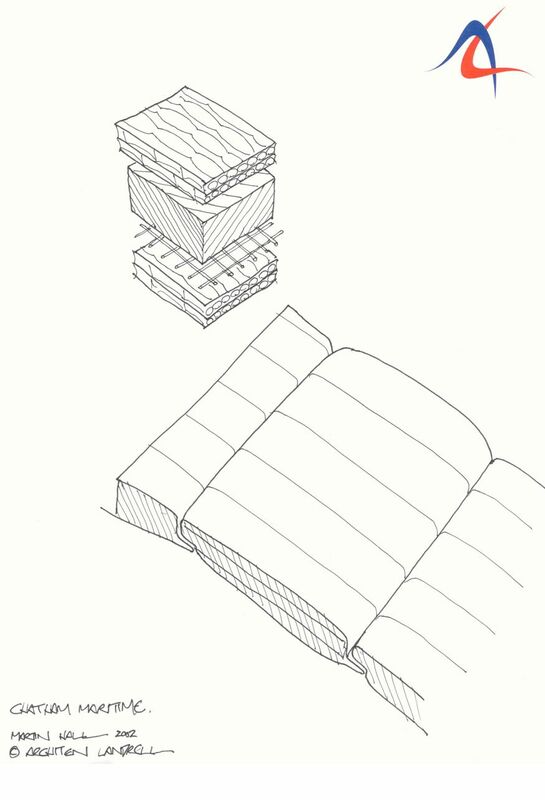 To provide structural strength the sandwich has a woven synthetic fabric scrim bonded to the insulation that enables the membrane to span distances of up to 100 feet. The biggest challenge for the company was in devising a system of joining the individual strips of insulated membrane, retaining a continuous thermal barrier, carrying pre-stress an d transient loads and forming a long term vapour barrier. Because of the large volume of insulating membrane the shaped membrane had to be assembled on site. The company developed a mechanical interlocking seal design that enabled the individual strips to be shaped and prepared in the factory but delivered to site in a controlled order and assembled in-situ before being hoisted into the roof space as a complete membrane. It was then tensioned and fixed into place using aluminium strips and webbing tensioners. 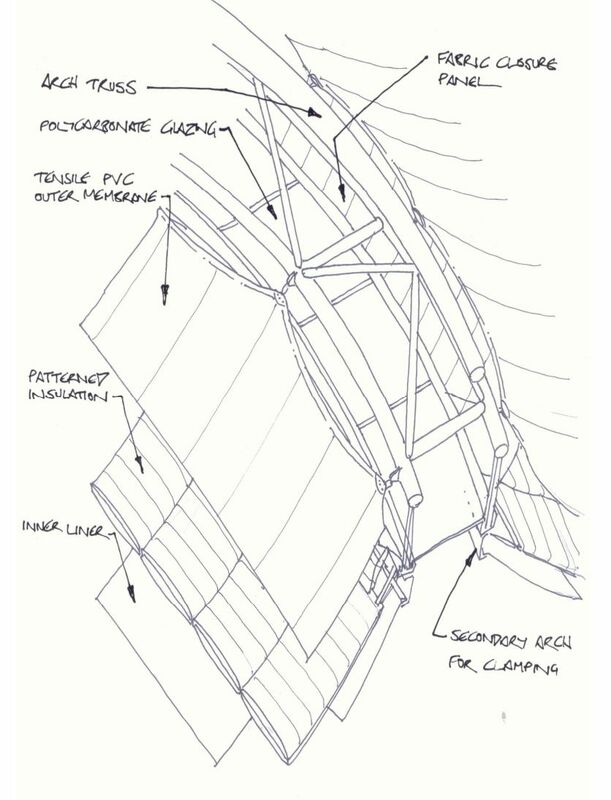 The site jointing and the connection of the thermal layer to the steel arch and the building perimeter were designed to form a continuous vapour barrier to condensation, always a potential headache in a thermally insulated roof space. Condensation forms on the inner surface of the outer membrane and drips down onto the outer surface of the thermal insulation. Channels at the roofs perimeter collect the drips and allow water to safely drain away to the outside. With currently available insulation materials an insulated membrane roof has one drawback; it is opaque. To let in natural light, a continuous roof light was incorporated into the steel arch that forms the spine of the building. The loss of translucency of the membrane roof inside the food court area is more than balanced by the glazed arch which illuminates the space with natural light and emphasizes the volumetric space. The inner liner is used as a surface on which to project moving images; emphasizing the relaxed environment of the food court and counterbalancing the busy retail buzz of the shopping area. 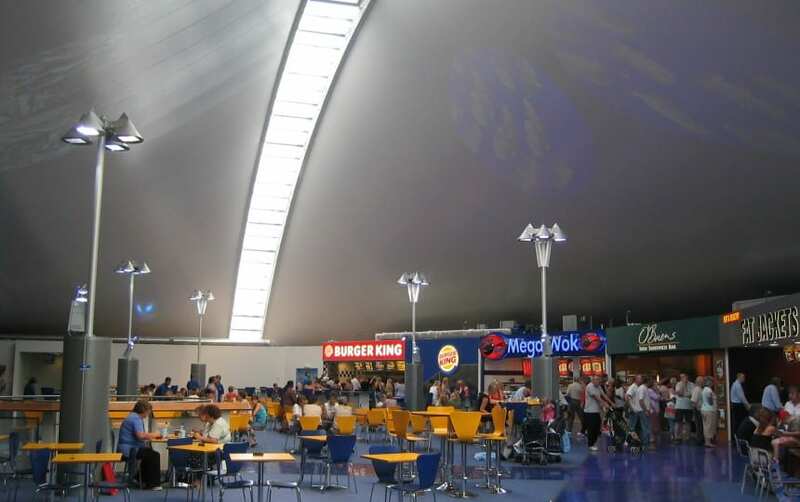 The Chatham Food Court tensile roof provides an extremely significant development in thermally insulated membrane roofs, in that it satisfies stringent thermal performance requirements while providing a visually arresting building within a tight budget. By overcoming the thermal limitations usually associated with fabric, it becomes viable as a building material in areas previously off-limits to membrane construction. The widely acknowledged benefits of fabric can now be introduced into considerably more building types where lightweight construction has intrinsic advantages. Fabric has now come of age. As Managing Director, Lance's passion for tensile fabric architecture & knowledge is inspirational.